There is something about Winter that ignites the nesting instinct in me. After all its the season to snuggle under the duvet and cherish life at a slow pace. Though we dont get to experience snow here still the chill in the air makes us comfortable enough to increase our appetite for all things good. Afterall its the season to enjoy things that we generally don't get to. Think of outdoors, think of picnics, think of all the shawl and carpet sellers flocking in the neighbourhood ground and their exquisite offerings, Think of the riot of colours in the garden and the delicate flowers, think of those foggy smoky mornings and taking a long walk in search of a glass of Date palm sap, think of all the fairs and catching up with your old friend in the ground, Think of all the colourful produce in the market and having a great meal out of them, think of soaking in the afternoon sun and preparing a big batch of boris for the year ahead, Think of putting up the Christmas tree and your house smelling of orangy-cinnamony with all your Christmas bakes, think of the smell of khejur gur during Sankranti...Winter definitely makes me dizzy with all its promise for a good life. For me its the time to finish all unfinished projects. I feel the urgency to deck up the home and make it toasty and warm, creating pretty things for the kids and the family and keeping an ongoing supply of cookies to go with all our evening cuppa. There definitely is extra time of cuddling and gobbling and snuggling with the kids. What is winter without the air filled with laughter, joy and cackle. And while we talk of winter can you leave notun alu or new potato behind. Just like winter, these little balls of starchy goodness are very promising. you can cook them in myriad ways. Think of pan tossing them with herbs, garlic and butter or roasting them till crisp and golden at the edges, or crusting them with pickling spices. 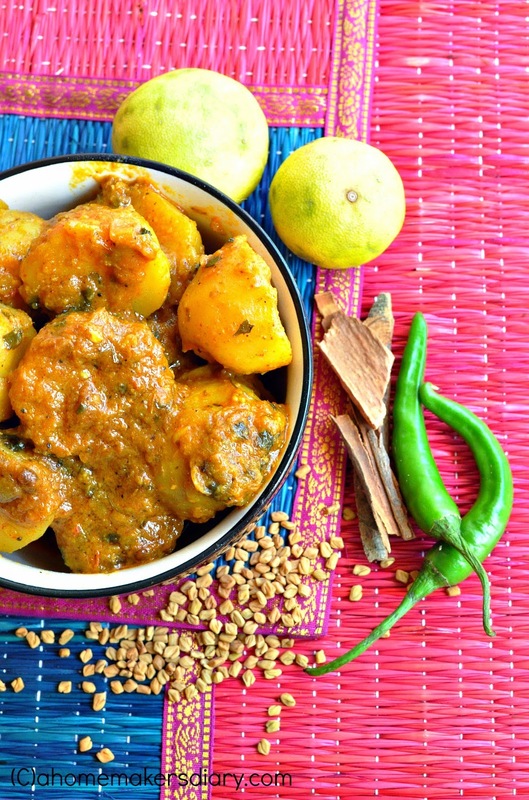 Or if your tastebuds lies in all things Indian, just make aloo'r dom, Potatoes simmered in a spicy gravy base to get the best out of them. And the combo with Koraishuntir kochuri or luchi on a chilly winter morning can win you many wars. 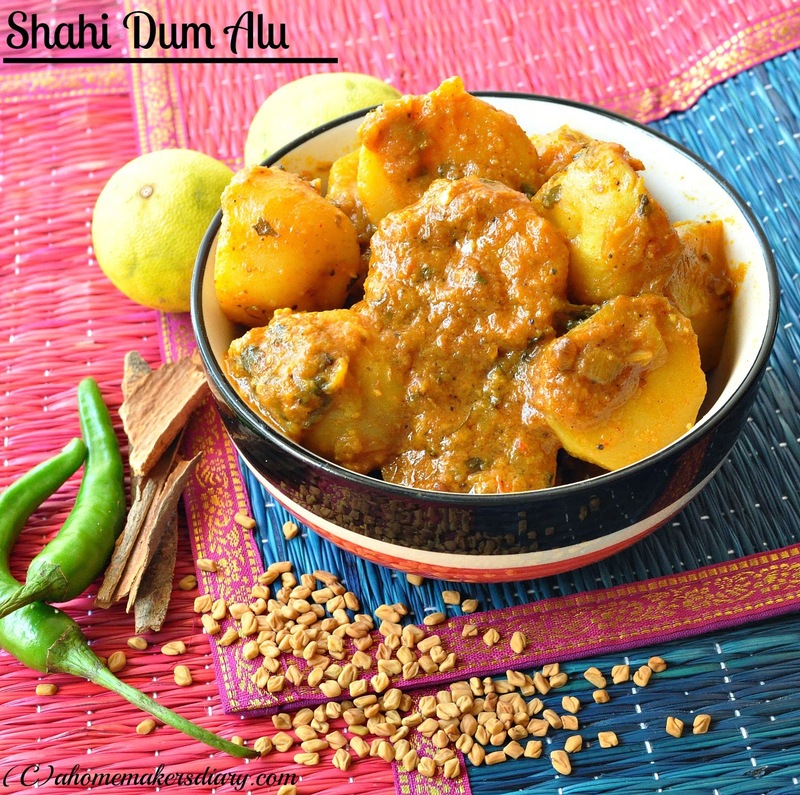 Todays alu dum recipe is my take on the spicy Dum alu that uses onion and garlic. 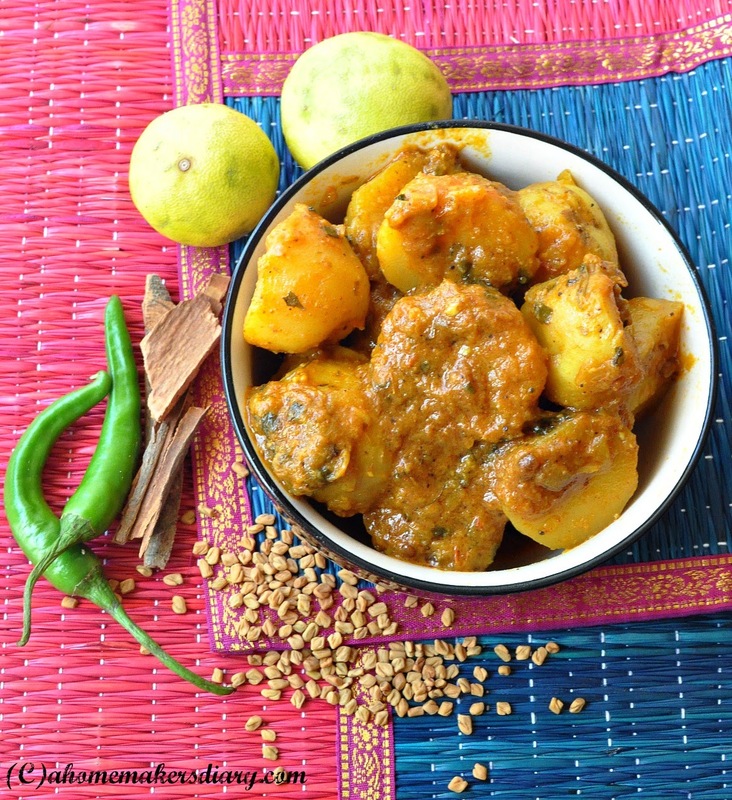 Find the Bengali notun alu'r dum recipe HERE. Rub the new potatoes on a rough surface to peel the skin or rub with the back of your knife. If the sizes are bigger like the ones I used here, cut them in half. Or keep them whole and prick with a fork at 2/3 places.Wash and boil till 3/4 done in salted water. Drain the water and mix with salt and turmeric. Peel and thinly slice the onion. Heat 1 tbsp oil and fry the potatoes on low flame to get a golden crust on all sides. Take out and keep aside. Heat the rest of the oil and temper with fenugreek seeds and slited green chilies. Once they start to splutter add the sliced onion and a pinch of salt. Fry on medium flame till the edges turns light brown (5-6 minutes). Add the garlic paste, chili powder and turmeric. Saute till the raw smell is gone. Add the coriander powder and cook for a minute. Now add chopped tomato and a pinch of salt. Cover and let it get cooked. Cook till the tomatoes are mushy and oil starts to bubble at the sides. Whip the yogurt till smooth. Lower the lfame to the minimum and add to the pan. Mix well till everything comes together (2-3 minutes). Add the poatoes and coat with the gravy. Add a cup of warm water. Check the seasoning. Crush half of the Kasuri methi, cover and let it simmer for 8-10 minutes on low flame or till the potatoes are soft. Add the milk/ cream if using, adjust the seasoning, mix in the rest of the kasuri methi. Cook till the gravy coats the potatoes. Finish by sprinkling a pinch of garam masala powder. Cover and give it a 5 minutes standing time before serving. Serve with pulao, luchi, puri, paratha or plain roti. Looks so good! This I am going to make soon! Lovely recipe ...looks so superb ! Nice recipe of shahi dum alu.